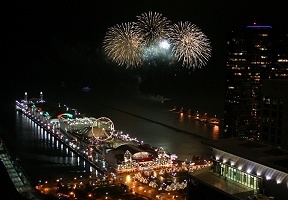 Widely known as the “unofficial kick-off” to the summer, Memorial Day weekend is a time when neighborhoods become more lively, families lay out blankets for a lakefront BBQ, and fireworks light up the Chicago skyline. To help you get started we rounded up a few interesting events occurring around the city. The City of Chicago and the Department of Cultural Affairs and Special Events are honored to announce the Grand Marshal for Chicago’s Memorial Day Parade and Wreath Laying Ceremony on Saturday, May 26. The Wreath Laying Ceremony will begin at 11 a.m. on Daley Plaza (Dearborn and Washington Streets). The parade will then step off at noon and proceed south on State Street from Lake Street to Van Buren Street., Major General Charles W. Whittington Jr., Deputy Commanding General (Vice “RC”), First United States Army, will serve as the parade’s Grand Marshal. Eighteenth Street Development Corporation (ESDC) presents its ninth annual Mole de Mayo Festival, the only outdoor mole cook‐off event celebrating Latino culture and Mexican cuisine. The festival is set to take place on 18th St. and Ashland Ave. from May 25-27, 2018 in the rich and diverse neighborhood of Pilsen on the southwest side of Chicago. Spectators are encouraged to participate in an early evening celebration of music, nature and summertime fun with the Jabberwocky Marionettes. This outdoor event imagines the Calumet River, West Pullman Park, and Palmer Park through many geological ages with T-Rexes and incredible theatric effects and puppets. One of the city’s top attractions is Navy Pier, a six-block stretch of rides, restaurants and entertainment that attracts more than 9 million people each year. Memorial Day weekend kicks off a summer of fun at the pier, and the Miller Lite Beer Garden and Aon Summer Fireworks both start the season this weekend. If you want to scope out the innovative venue called The Yard, the Chicago Shakespeare Theater is producing Waiting for Godot during this weekend. The Science Behind Pixar exhibit is coming to the Museum of Science and Industry, Chicago this May. Discover the science and technology behind “Toy Story,” “A Bug’s Life,” “Finding Nemo,” and more timeless Pixar films with The Science Behind Pixar, opening at the Museum of Science and Industry, Chicago (MSI) on May 24, 2018.